Since the 2000s, Tim Burton has played it relatively safe, often falling back on his name as a familiar (and marketable) brand that mainstream audiences know and recognize. With the horrible misfire that was the Planet of the Apes (2001) remake, he directed a series of impersonal studio blockbusters that included the likes of Charlie and the Chocolate Factory (2005) and Alice in Wonderland (2010). Sure, there was the occasional, more personal effort, like Sweeney Todd: The Demon Barber of Fleet Street (2007), but Burton only seemed to turn off the autopilot on animated projects like Corpse Bride (2005). It seems like Burton uses his clout from big budget box office successes to make more personal projects. 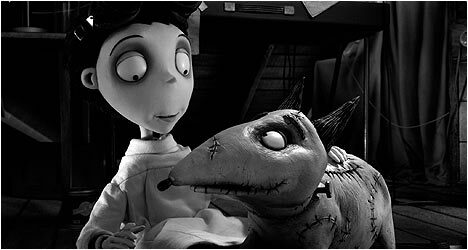 Case in point: Frankenweenie (2012), a black and white stop-motion animated film that expands the live-action short he made early on in his career into feature-length. Unfortunately, this quirky, deeply personal film was released around the same time as several other similarly themed animated films and only had a modest performance at the box office. It’s too bad really, as it is Burton’s best film in ages. Victor Frankenstein (Tahan) is a bit of a loner – a child who spends most of his free-time making crude, animated movies rather than making friends with kids his own age. He doesn’t need friends so long as he has man’s best, his dog Sparky. However, tragedy strikes one day when Sparky is accidentally killed. Understandably distraught, Victor is inspired by his science teacher (who looks suspiciously a lot like Vincent Price) and his love of horror films to resurrect his beloved pet a la Dr. Frankenstein’s monster. Complications arise when his creation escapes the confine of his house and escapes out into the world. Frankenweenie is Burton’s most personal and engaging film in years as it harkens back to his early work. Victor crosses the boundaries of life and death, which echoes the Maitlands in Beetlejuice (1988). Victor and his family live in the same kind of homogenous suburbia as Ed and his adoptive parents in Edward Scissorhands (1990). Victor makes the same kind of rudimentary yet goofily heartfelt monster movies as Ed Wood does in Ed Wood (1994). It’s no coincidence that these aforementioned films are also among Burton’s very best. Frankenweenie also sees Burton reunited with past collaborators like Catherine O’Hara (Beetlejuice), Martin Short (Mars Attacks! ), Martin Landau (Ed Wood), and Winona Ryder (Edward Scissorhands) providing the voices for several characters in the film. Behind the scenes, frequent collaborator Danny Elfman returns to provide an evocative score that pays tribute to the Universal horror films of the 1930s. As the title suggests, Frankenweenie is basically Frankenstein (1931) for children but with plenty of sly references for his older fans (at one point, Victor’s parents are watching Christopher Lee as Dracula in a Hammer horror movie). Victor fits in quite nicely with Burton’s roster of cinematic outsiders marginalized by the ignorant masses that misunderstand them. The atmospheric black and white stop-motion animation has a texture to it that almost feels tangible unlike most of the CG animated films being made today. Sadly, this throwback to an older style of animation, coupled with it being in black and white, probably did not help it commercially but I think Frankenweenie will be rediscovered on home video where its audience will grow and its legacy will endure. Hopefully, its modest commercial returns will not scare Burton off from making more personal films like this one. “Original Short: Captain Sparky vs The Flying Saucers” is the clever movie within a movie that Victor creates (with Sparky’s help) and is included in its entirety. It is a loving homage to alien invasion films from the 1950s. “Miniatures in Motion: Bringing Frankenweenie to Life” takes a look at the stop-motion animation process for this film. We see how the animators brought Burton’s original drawings to life. It is wonderful to see all these people crafting a film with their hands instead of relying predominantly on CGI. “Frankenweenie Touring Exhibit” is a brief featurette about a traveling exhibit of props and production sketches from the film displayed for people from all over the world to see. “Original Live-Action Frankenweenie Short” was made in 1984 and was shot in gorgeous black and white. It’s about a young boy named Vincent (Barret Oliver) who decides to resurrect his dead dog Sparky a la Dr. Frankenstein. Shelley Duvall and Daniel Stern play his very Leave It To Beaver-esque parents. Also featured is the late-great Paul Bartel as Vincent’s science teacher. Finally, there is a music video for “Pet Sematary” by the Plain White T’s. It is your standard tie-in video with the band playing over footage from the film.